much love, illy: (friendly) advice from me to you...and to myself. and here were are, folks. 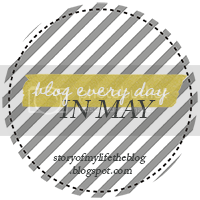 just over a week of Blog Every Day in May. woohoo! i really do applaud those that have been going straight through the challenges. you guys are my heros. seriously. it's so easy to get wrapped up in blogging. it's easy to keep that blogger switch on all the time. it's easy to zone the rest of the world out and just immerse yourself in the lives of other bloggers. a wise word of advice that i heard from my college professors when it came to writing is to write what you know and if you don't know what you are writing about, do research! just like any writer, i think what makes a well-rounded blogger is one who does their research first, one who immerses themselves in the fullness of life. often times that means, shutting the face of the laptop and putting away our phones and just living life. when we are somewhere with our family or friends or experiencing something new, to be fully there, not just in body but also in mind. soak up the sights and the smells. laugh and smile, not because a camera is pointed at you. taste and see the goodness of God and the beauty of the moment, not because it makes good writing material or that it'll give you a zillion likes. i know i am preaching to the choice in a sense, yo. but this preacher is also preaching to herself. and sometimes the best advice is the one that is worth repeated because we are forgetful people, are we not? i know i am. p.s. are you Iris P 'cause you just won the EcoShag giveaway!?! shoot me an email at muchloveilly at gmail dot com to claim your prize. congrats to Iris and thank YOU, Ecoshag for a super amazing giveaway! Such great advice and sooo true. I adore that top, and you are so gorgeous! This is some of the best blogging advice I've ever heard. Thanks for the beautiful reminder! Happy Tuesday! Oh fabulous advice!! I was just trying to remind myself of this the other day while at the park with my kiddies... there was time for some great photos but there was time as well where the cameras were put down and we just played... it was marvelous! PS... LOVE the little doodle! You have some fabulous handwriting my friend! Love this piece of advice! It's so true to get wrapped up in the moment that it's nice to take a step back and thank God what he's blessed you with! I am LOVING that top! And very good advice. Blogging for me is my creative outlet, which is why early on I decided to not be involved with sponsorships and stuff that would make me feel pressured to blog. Because what's the fun in that? Life is so much easier when I write from my heart and not from a commercial place. You know? This is a cute cute cute outfit. love that shirt so much! I love it. Preach! ;) Also, I love your top. Also, your description of the thin spectacled question reminded me of Harry Potter for some reason? I don't know why, but I liked it. Love it. Such good advice! And your outfit is stinking adorable! this is such GREAT advice! and i LOVE your top girl!!! Haha, I was just reminding myself of that the other day! Would you like to follow each other on GFC? I am a new to the blogging world and would love it if you would stop by my neck of the woods! love that advice, i've definitely learned to do that over the past couple of years! and i love that color. and you in that color. wow u look so gorgeous! That's so very true! :) Thanks for sharing, anyways - we bloggers tend to forget it sometimes, not? Have a great rest of the week. xo. 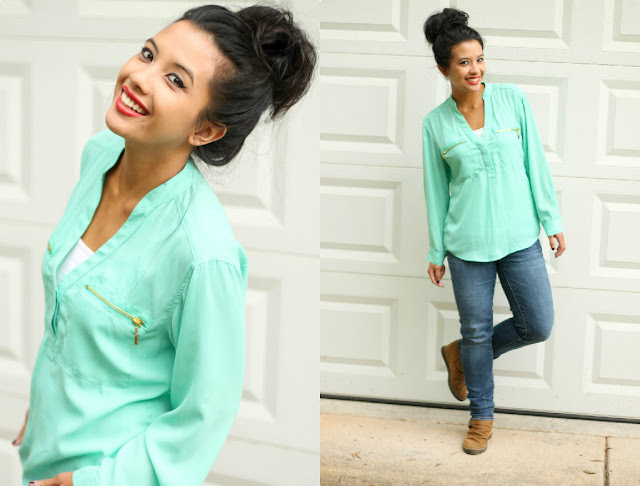 sweet pictures and beautiful mint blouse! Good advice, girl! It's so easy to get caught up in the blog world and forget all that's happening around us sometimes. p.s. LOVE your handwriting, it's so cute! Great advice. 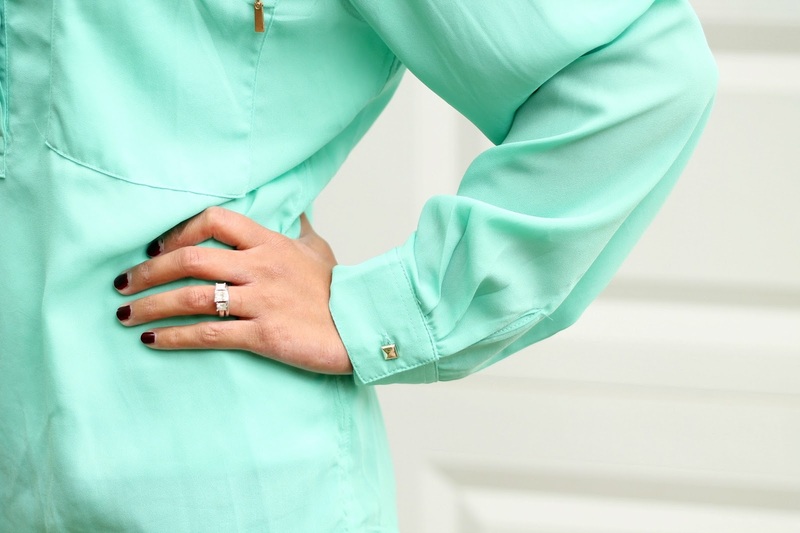 :) That mint color is so flattering on you! Excellent advice! Many of us blog for a living, so we can be home with our families and have a better quality of life. 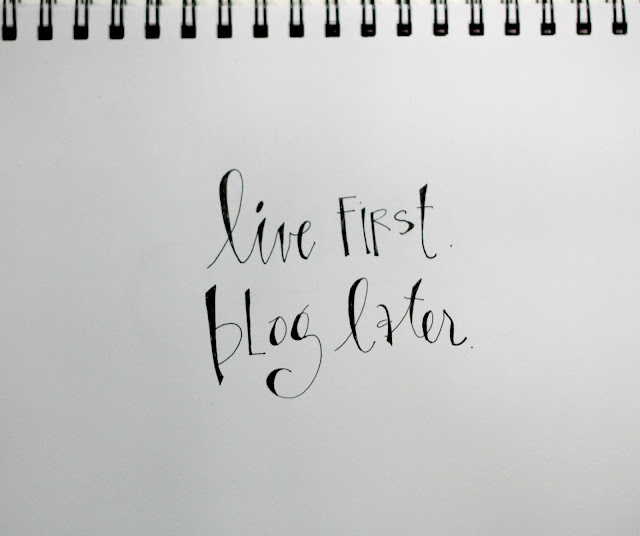 What good is that if we spend ALL our time blogging and no time enjoying our life? Love the colour of your top, too! This is soooo true and is definitely something that we as bloggers need to hear quite often! Also--you are rocking that top knot! I am jealous of your hair. That is great advice :) And love love love that minty blouse on you...so pretty! This is really great advice since I am a newbie to the blogging world. I love that mint blouse on you! So pretty! This is so encouraging for me! I even wrote a post about this on my blog too ... thanks for the inspiration!